I'm 3 weeks postpartum and looking ahead to getting fit. The game plan? Joining my husband in his No Sugar No Grain diet, chugging 3 liters of water a day and working out again once I finish the "sitting month" and my OB/GYN gives me the all clear. Naturally, new workout clothes were on my shopping list. I came across a Fabletics deal that featured a workout set for $15 when signing up for the VIP program. The VIP program is a cross between a discount program and a fitness clothing box. On the first of the month, the VIP member is sent curated outfits, starting at $49.95, which is around a 40% discount off the retail price, and the VIP selects what outfit they would like or they can skip the month. If the VIP does not select an outfit or skip the month, the VIP is charged anyway and the monthly fee is treated as a credit to purchase outfits in the future. Now, $49.95 is inexpensive considering the cost of my favorite workout compression tights from VSX, Victoria Secret's fitness line (featured in my previous post) is $69.50 and my favorite top, the incredible sports bra, is $59.50. The idea that an entire workout wardrobe could be built on just $350 was very promising. I opted for the Cyclone set which consists of the Aventura Tank and the Victoria Pant. The order arrived quickly, within 3 days! That's like Amazon fast! But I was really disappointed in the quality of clothes. They fell more in line/slightly below Old Navy quality workout clothes. The items were very comfortable but definitely weren't workout worthy as workout clothes need to be much more durable fabrics with reinforced seams. The tank was a regular cotton blend tank and the pants were moisture-wicking but both felt unsubstantial. They didn't have the supportive feeling I like in my athletic wear. 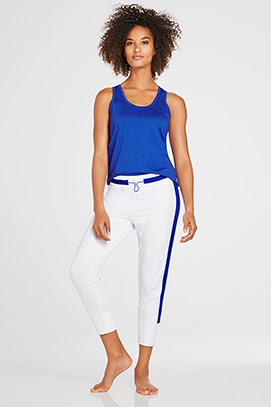 It could be argued that the outfit I purchased from Fabletics was meant to be more lounge wear than workout clothing but the Victoria pant advertises being made for performance. The outfit isn't getting returned because it is super cute and will be suitable for my postpartum walking routine but I did cancel my VIP membership. In part because Old Navy athletic clothes can be had for less than $49.95 an outfit for similar or better workout clothes and because I prefer the VSX line but mainly because I didn't want to be charged $49.95 every month and have one thing to remember to choose or skip. I'm horrible at keeping up with subscriptions. I can't tell you how long it took me to finally change my CSA preferences so they would stop sending fennel. I immediately went to cancel my membership which couldn't be done online. There's a 24 hour cancellation number staffed with customer service representatives who try to address any and all concerns about the deliveries to prevent membership cancellations. The rep was very nice and after a couple of attempts to make me a satisfied customer, he acquiesced and cancelled my membership without any attitude or hardball sales tactics. Fabletics is great for women who are super fit and like the look of athletic clothes as everyday wear or for women who want to be comfortably stylish while always looking like they are coming from some kind of fitness activity. I'm not convinced that the clothes are great for actually working out.